In recent years, stem cell research in dentistry has grown rapidly with the potential application for oral and maxillofacial tissue regeneration. Mesenchymal stem cells (MSCs) from the oral and maxillofacial region are easy to access, have a high proliferation rate, multipotency, and potent immunomodulatory functions. They are excellent cell sources not only for stem cell-based therapy of dental and craniofacial diseases, but also with the potential for the treatment of other inflammatory diseases. In this review, we provide an overview of different types of MSCs that have been isolated and characterized from several origins such as dental pulp, exfoliated deciduous teeth, the periodontal ligament, the dental follicle, the dental papilla, oral mucosa, and gingiva, with the focus on the potential clinical applications for each type of dental stem cell. Stem cells are defined as a special group of clonogenic cells that are characterized by the ability for self-renewal and multilineage differentiation. These cells are responsible for normal tissue renewal as well as for healing and regeneration after injuries . Stem cells can be divided into three main types, embryonic stem cells (ESCs), adult or postnatal stem cells (ASCs), and induced pluripotent stem cells (iPSCs). ESCs are found in the inner cell mass of mammalian blastocysts during the early stages of embryo development and have unlimited expansion and pluripotency to differentiate into all types of somatic cells . A new source of pluripotent stem cells, iPSCs, have been innovatively generated from human somatic cells and potentially can provide tremendous opportunities for tissue regeneration and patient-specific therapies, while avoiding ethical issues surrounding the use of human embryos and tumorigenic potential [3, 4]. ASCs have been identified in almost all the postnatal tissues. Because of their easy accessibility and great ability to generate a tissue different to the site from their origin, ASCs have increasing potential to be used for treatment of degenerative diseases . Mesenchymal stem cells (MSCs) are multipotent progenitor cells present in many tissues throughout the body and have the capacity to differentiate into bone, cartilage, tendon, fat, and muscle . Furthermore, MSCs are important immunoregulatory cells because they can sense and control inflammation in injured tissues by expressing a variety of chemokines and cytokines . To date, different types of MSCs have also been isolated and characterized from oral and maxillofacial regions. The objective of this review is to describe new findings in the field of dental stem cell research and their potential applications in tissue regeneration and therapy of inflammation-related diseases. Several types of dental MSCs have been identified in different dental tissues, including: 1) the dental pulp of permanent teeth (dental pulp stem cells, DPSCs) [8••]; 2) the naturally exfoliated deciduous teeth (stem cells from human exfoliated deciduous teeth, SHED) ; 3) the apical papilla (stem cells from apical papilla, SCAP) [10, 11]; 4) the periodontal ligament (periodontal ligament stem cells, PDLSCs) ; 5) the dental follicle (dental follicle progenitor cells, DFPCs) , and 6) the oral mucosa and gingiva (gingiva-derived mesenchymal stem/stromal cells, GMSCs) [14••]. In comparison to bone marrow-derived mesenchymal stem cells (BM-MSCs), the most extensively studied MSCs , these DSCs, derived from oral and maxillofacial areas, have also been demonstrated to possess potent self-renewal/colony forming and multipotent differentiation capabilities (Fig. 1). MSC populations have been isolated from dental pulp tissue of permanent human teeth, and are generally referred to as DPSCs. DPSCs fulfill the criteria as stem cells, based on their self-renewal and the ability to differentiate into osteoblasts, adipocytes, neural cells, and odontoblasts [8••, 15]. Additional studies have confirmed that DPSCs can also differentiate into chondrocytes and myoblast-like cells and induce endogenous axon guidance [5, 16, 17]. Subsequent studies have demonstrated that transplantation of in vitro expanded DPSCs mixed with hydroxyapatite-tricalcium phosphate (HA/TCP) scaffolds can generate dentin/pulp-like complexes in immunocompromised mice [8••, 15, 18]. The newly formed vascularized pulp-like tissue is surrounded by a layer of odontoblast-like cells that express dentin sialophosphoprotein (DSPP) and contains dentinal tubules [8••, 19]. The differentiation of DPSCs to a specific cell lineage is mainly determined by the components of local microenvironment such as growth factors, signaling molecules, transcription factors and extracellular matrix proteins. The odontoblastic differentiation of DPSCs and formation of reparative dentin over the exposed pulp are promoted by dentin matrix protein-1 (DMP-1) . Additionally, DPSCs can be induced into odontoblast lineage when treated with transforming growth factor-β1 (TGF-β1) alone or in combination with fibroblast growth factor-2 (FGF-2) . It has been considered a difficult task to regenerate all of the pulp-dentin tissue due to conditions whereby the pulp tissue usually has only one apical foramen to allow angiogenesis for the engineered tissue, and there are different types of cells in different zones with complex innervation [22, 23]. A study using human tooth root fragments with an enlarged canal space showed that the regenerated pulp-dentin-like tissue formed a continuous layer with original dentin surface when the canal was filled with PLG scaffold seeded with DPSCs . Most recently, complete pulp regeneration was achieved in adult canine pulpectomized teeth after autologous pulp stem/progenitor (CD105+) cells with stromal cell-derived factor-1 (SDF-1) were transplanted into a root canal [25•]. Furthermore, functional angiogenesis/vasculogenesis and reinnervation/neurogenesis in the regenerated pulp tissue have been demonstrated through laser Doppler analysis and the electric pulp test . Although these studies have primarily shown the potential of complete pulp regeneration, they were done under the conditions that are not relevant to most clinical scenarios with infected root canals and apical periodontitis. Under these experimental conditions, cells/scaffold were implanted into freshly removed clinically healthy pulp tissues in incisors with large apical foramina. Therefore, further studies are needed to test the limit of the canal opening size that allows pulp regeneration in the coronal end of the canal and whether the addition of angiogenic factors can compensate for the smaller canal opening . Clinically, when a tooth has been diagnosed with irreversible pulpitis, the available pulp is considered inflamed and/or infected and, therefore, it is removed even though some portion of the pulp is still viable. 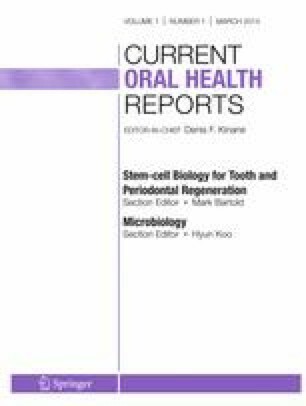 Recent studies have compared the cells from normal and inflamed human dental pulps regarding the presence of stem cells, their proliferation and differentiation potentials [27, 28, 29, 30]. Diseased pulp contains viable cells with the potential for ex vivo expansion and proliferation, a similar percentage of STRO-1-positive cells and ex vivo odonto-osteogenic differentiation capacity. As the inflamed pulp contains preserved stem cells, it could be envisaged as a suitable source of DPSCs for dental pulp regeneration, not simply discarded as biological waste. Recent studies have demonstrated that implantation of DPSCs into periodontal defects of dogs results in the regeneration of well-formed mature bone with neovascularization [31, 32]. One clinical study in humans tested to treat alveolar bone defects with autologous DPSCs, which were obtained from maxillary third molars and then combined with a collagen sponge scaffold. The filling of this biocomplex in the space left by extraction of the mandibular third molar resulted in the complete regeneration of defective bone at the injury site, suggesting DPSCs as a potential cell source for periodontal regeneration . Because of their versatility, DPSCs have been shown to possess therapeutic effects for myocardial infarction , muscular dystrophy , cerebral ischemia, and chemical-induced corneal injury [36, 37]. In a recent study, neuronally predifferentiated DPSCs were labeled with a vital cell dye and transplanted into the cerebrospinal fluid of rats with induced cortical lesions. Those cells were subsequently detected in the injured cortex and found to express neuron-specific markers, suggesting that engrafted DPSC-derived cells can integrate into the host brain and may serve as a useful source of neuro- and gliogenesis in vivo . Moreover, the transplantation of DPSCs promoted neurogenesis and vasculogenesis in an induced peri-infarct area, and enhanced recovery after TMCAO in rats, indicating that DPSCs can be a potential candidate in the treatment of stroke . SHED were first identified and isolated noninvasively from the pulp of human exfoliated primary incisors, which are considered disposable tissues . A subsequent study also isolated and classified SHED as being ‘immature DPSCs’ (IDPSCs). These cells expressed the embryonic stem cell markers Oct4, Nanog, stage specific embryonic antigens (SSEA-3, -4), and tumor recognition antigens (TRA-1-60 and TRA-1-81) . SHED can undergo osteogenic, adipogenic, neurogenic, myogenic, chondrogenic, endothelial, and odontoblastic differentiation [9, 40, 41, 42, 43]. In comparison with DPSCs, SHED exhibit faster proliferation rates and increased population doublings [8••, 41, 44]. Although both SHED and DPSCs originate from the dental pulp, they demonstrate differences regarding their odontogenic differentiation and osteogenic induction. Ex vivo expanded SHED transplanted into immunocompromised mice generate odontoblast-like cells directly associated with a dentin-like structure. However, they are unable to regenerate complete dentin-pulp-like complexes in vivo [8••, 9]. On the contrary, DPSCs are able to form dentin-pulp-like complexes, but not lamellar bone [8••]. The levels of alkaline phosphatase activity and osteocalcin production during osteogenic differentiation are higher for SHED than for DPSCs . Furthermore, SHED may present an osteoinductive potential since they were able to induce differentiation of recipient murine cells into bone-forming cells . These discrepancies in the properties of DPSCs and SHED may be related to their different gene expression profiles, as the genes related to cell proliferation and extracellular matrix formation, such as TGF-β, FGF-2, collagen (Col) I, and Col III, were significantly highly expressed in SHED compared with DPSCs . The potential use of SHED as cell-based therapies has expanded to a large number of tissues due to their high degree of plasticity, stemness, and ability to cross lineage boundaries. Using a tooth slice model, SHED seeded onto the synthetic scaffolds form well-vascularized pulp-like tissue in vivo. In addition, odontoblast-like cells derived from this tissue express dentin sialoprotein (DSP) and localize against the existing dentin surface . A subsequent study using the same model demonstrated that SHED differentiated into functional odontoblasts capable of generating tubular dentin and angiogenic endothelial cells . Notably, when BMP-2 signaling was blocked, SHED could not differentiate into odontoblastic-like cells in tooth slice/scaffolds . Most recently, a closer clinical model using extracted endodontically treated premolars was designed to test the possibility of pulp tissue regeneration by implanting SHED seeded on two different scaffolds (polylactic acid and collagen) incorporated with different types of growth factors (BMP-2, TGF-β1). An ultrastructural examination of the SEM micrographs revealed cell adherence within all of the pulp constructs, with little difference between the scaffold types or the addition of growth factors. These findings suggest that future regenerative endodontic treatment may involve the cleaning and shaping of root canals followed by the implantation of vital pulp tissue constructs created in the laboratory . SHED combined with HA/TCP can repair critical-size calvarial defects in mice with substantial bone formation . Furthermore, SHED have been shown to regenerate bone in critical-size mandibular defects in mini pigs. This result from a pre-clinical study in a large animal model may permit translation of stem cell-based therapy in orofacial reconstruction to human clinical trials . Embryologically derived from the neural crest cells, SHED may share similar tissue origin with the mandibular bone cells, and, therefore, may serve as a better cell source for the regeneration of alveolar and orofacial bone defects. SHED have been induced to express neural markers such as nestin  and form neural-like spheres with a medium optimized for neural stem cells in vitro. After transplantation of SHED spheres into parkinsonian rats, their behavioral disorders were alleviated, suggesting SHED may be a promising source for the treatment of neurodegenerative diseases . The apical papilla refers to the tissue loosely attached to the apex of the developing root in human immature permanent teeth . There is a cell-rich zone lying between the apical papilla and the dental pulp. The distinction between these tissues is that the apical papilla represents a precursor tissue for the radicular pulp and plays a pivotal role in root development [10, 11, 51]. The MSC surface marker STRO-1 was positive in apical papilla cells, which led to the discovery of new type of stem cells in this tissue . SCAP have the capacity to undergo osteo/dentinogenic, neurogenic, and adipogenic differentiation, and can also differentiate into odontoblast-like cells and produce dentin-like tissue in both in vitro and in vivo models . Compared with DPSCs, SCAP display an expression pattern of osteo/dentinogenic markers and growth factor receptors similar to that observed in DPSCs, but these markers are expressed at lower levels in SCAP than in DPSCs. As SCAP are derived from a developing tissue, they are more robust than DPSCs in terms of population doubling capacity, proliferation rate, telomerase activity, and cell migration ability [11, 51]. All of these findings suggest that SCAP may represent a population of early stem/progenitor cells and are suitable for cell-based tissue regeneration, particularly preferential for root regeneration [11, 51, 52]. SCAP represent a population of cells participating in root formation and are able to differentiate into odontoblast-like cells with a very active cellular migratory and mineralization potential, leading to organized dentin-like structures in vitro. These structures progressively express differentiation markers, including DSPP, BSP, OCN, ALP, thus showing the characteristics of osteodentin . When SCAP are combined with HA scaffolds and implanted subcutaneously in immunocompromised rats, bone- and dentin-like mineralized tissues are formed within 12 weeks following transplantation . Furthermore, when SCAP were seeded onto synthetic scaffolds, inserted into tooth fragments, and then transplanted into immunodeficient mice, a pulp-like tissue with well-established vascularity was induced and a continuous layer of dentin-like tissue was deposited onto the canal dentinal wall . These findings have provided evidence that SCAP can be used in tissue engineering/regeneration protocols as an approachable stem cell source for osteo/odontogenic differentiation and biomineralization. Interestingly, when the apical papilla was removed at an early stage of the root development in mini pigs, the root development was halted despite the pulp tissue being intact. In contrast, other roots containing apical papilla showed normal growth . Furthermore, several clinical cases also demonstrated the role of apical papilla in root formation. During the treatment for a fractured immature incisor with pulp exposure, the apical papilla was retained while the pulp was extirpated. Continued root-tip formation was observed after root canal treatment . After root canal disinfection, surviving SCAP may give rise to primary odontoblasts to complete root formation in several cases of apexogenesis in an infected immature tooth with periradicular periodontitis or abscess [23, 51, 54, 55]. This approach may be more conservative and should be provided when treating immature teeth with endodontic infection. Collectively, these findings support that the apical papilla is likely to play a pivotal role in root formation. In a mini pig model, the root-shaped HA/TCP block containing SCAP was coated with Gelfoam containing PDLSCs and inserted into the alveolar socket of a recently extracted tooth. After 3 months, a bio-root was formed and capable of supporting a porcelain crown and participating in normal tooth function. This result implies the feasibility of using a combination of autologous SCAP/PDLSCs in conjunction with artificial dental crowns for functional tooth regeneration . The periodontal ligament (PDL) is a specialized tissue located between the cementum and alveolar bone and plays an important role in tooth support and in regulating alveolar bone volume. The presence of heterogeneous cell populations within the PDL suggests that this tissue contains progenitor cells which maintain tissue homeostasis and the regeneration of the periodontium. PDLSCs have been demonstrated to be a population of clonogenic adherent cells with the characteristics of postnatal stem cells and express cementoblastic and osteoblastic markers . Similar to the other DSCs, PDLSCs under defined culture conditions can differentiate into osteogenic, adipogenic, and chondrogenic cells [56, 57, 58]. PDLSCs have also been shown to differentiate into neuronal precursors . Interestingly, the multipotent differentiation capability of PDLSCs was up-regulated by Hertwig’s epithelial root sheath cells in vitro . When PDLSCs were transplanted into immunocompromised mice, cementum/PDL-like structures were regenerated . Since PDLSCs were firstly demonstrated to repair periodontal defects in mandible of rats , extensive research has followed to explore the potential of using PDLSCs to treat periodontal diseases in various larger animal models. Autologous PDLSCs from miniature swine were expanded ex vivo and labeled with green fluorescent protein (GFP). Afterwards, these cells combined with HA-TCP were transplanted into periodontal defects and GFP-labeled cells were identified in the newly formed bone with regenerated cementum and PDL in defect areas . For more challenging periodontal defects, apical defects were created in dogs to simulate human advanced periodontitis where one of the tooth roots was isolated from the surrounding bone. When ex vivo expanded PDLSCs, DPSCs, and DFSCs were grafted into these defects without scaffold, PDLSCs showed the best regenerating capacity of periodontium as well as peripheral nerve and blood vessel . Besides animal models, a retrospective pilot study in human has also demonstrated the therapeutic potential of autologous periodontal ligament progenitor cells (PDLPs) obtained from wisdom teeth. PDLPs behaved as PDLSCs, although they did not express the same panel of markers and showed lower multiple differentiation potential in vitro. PDLPs were implanted with bone grafting material into intrabony defects of patients who were monitored for 32 to 72 months. All defects were reconstructed and improved clinical outcomes were observed specifically in decreased tooth mobility and probing depth [63•]. Moreover, PDLSCs have been used to establish treatments associated with titanium dental implants. PDL regeneration was detected on titanium implant surfaces in a rat molar implant model . When PDLSCs loaded HA/TCP were implanted in a canine saddle-like peri-implant defect model, newly formed bone was found to fill in defects . In addition, one human clinical study has demonstrated cell-coated implant placement in the mandible and PDL formation around the implant surface. This model, so-called ligaplants, combined PDL cells with implant biomaterial and was successfully functioning during 6 – 60 months of observation . These findings hold great potential for PDLSCs as an alternative approach to osseointegrated dental implants and may provide efficient methods to enhance the outcome for implant treatment. The dental follicle is a loose ectomensenchyme-derived connective tissue that surrounds the developing tooth. This tissue contains progenitors for PDL cells, cementoblasts and osteoblasts, and then may play a crucial role in tooth development. Precursor cells have typically been isolated from human dental follicles of impacted third molars and express stem cell markers Notch1, STRO-1, and nestin . DFPCs have the ability to differentiate into osteoblasts/cementoblasts, chondrocytes and adipocytes in vitro [13, 67, 68]. DFPCs can also form compact calcified nodules in vitro, suggesting that these cells can differentiate into cementum . In addition, after transplantation into immunodeficient mice, DFPCs could form fibrous tissues and a cementum-like matrix on the surface of HA beads [69, 70] and show osteogenic potential . Meanwhile, the expression of cell surface markers compatible with those of fibroblasts was confirmed in human dental follicle tissues, suggesting the presence of immature PDL fibroblasts . Furthermore, in vivo study showed that DFPCs have the capacity to generate PDL . DFPCs, in common with SCAP, represent a population of cells from a developing tissue and might thus exhibit a greater plasticity than other DSCs. Interestingly, when comparing DFPCs and SCAP at the crown-forming stage, both cells shared similar characteristics and were capable of forming hard tissue in vivo as well as in vitro. However, SCAP had a significantly higher calcium accumulation than that in DFPCs and expressed an odontoblast marker, whereas DFPCs expressed a cementoblast marker. These differences might be explained by the developmental stage of the tooth germs from which these cells are derived . Both DFPCs and SHED can differentiate into neuron-like cells, but showed different expression patterns of neural cell markers when the cells were grown under the same culture conditions . When DFPCs in combination with a treated dentin matrix were implanted in the alveolar fossa of rats, they generated root-like tissues with a pulp–dentin complex and a PDL connecting a cementum-like layer to host alveolar bone, but not in the skull and omental pockets. These results indicate that the microenvironment into which stem cells are implanted affects the capacity of these cells to regenerate differing tissues. Furthermore, these findings demonstrate that DFPCs can be a feasible cell source for tooth roots regeneration . Gingiva is a unique fibrous tissue that lies over the alveolar bone and surrounds the teeth, recognized as a biological mucosal barrier and a distinct component of the oral mucosal immunity. Wound healing within the gingiva and oral mucosa exhibit markedly reduced inflammation, rapid wound closure, and fetal-like scarless healing [76, 77]. Among all dental tissues, gingiva is the most easily accessible and harvested. GMSCs have been isolated from the lamina propria layer of human gingiva and are shown to express pluripotency-related markers such as Oct-4, SSEA-4 and STRO-1 [14••, 78]. GMSCs have self-renewal capability and can differentiate into osteoblasts, adipocytes, chondrocytes, and neural cells [14••, 78, 79, 80, 81]. GMSCs showed highly clonogenic and long-term proliferative capability while they retain stable morphology and MSC characteristic at higher passages . These properties highlight GMSC as highly attractive candidate cells for clinical application wherein a large scale of ex vivo cell expansion is necessary. In vivo, GMSCs embedded with carriers and transplanted into immunocompromised mice can generate connective tissue-like structures [14••, 78], bone matrix [80, 82], and even two germ layer-derived (teratoma-like) tissues . When GMSCs are seeded on type I collagen and implanted locally, they can significantly promote the repairing of mandibular and the critical-sized calvarial defects in rats in 2 months . In a murine excisional full-thickness skin wound model, systemic infusion of GMSCs significantly promoted the repair process as shown by rapid re-epithelialization and increased angiogenesis . In addition, systemic infusion of GMSCs could also mitigate chemotherapeutic drug-induced oral mucositis in mice as presented by reversal of body weight loss, restoration of the disrupted epithelial lining, and increased proliferation of basal cells . Recently, accumulating evidence supported that MSCs are powerful modulators of both the innate and adaptive immune responses. These findings explain that the beneficial effect of MSCs for tissue regeneration is specifically through interaction with host/resident cells and production of a large array of secretory immunomodulatory factors [85, 86]. Systemic administration of GMSCs in murine colitis could reverse body weight loss, improve the overall colitis score, and restore normal intestinal architecture [14••]. The clinical signs of contact hypersensitivity, an allergy-related inflammatory disease, were alleviated after prophylactic and therapeutic administration of GMSCs. It has been shown that GMSC treatment reduced the infiltration of dendritic cells, CD8+ T cells, Th17, total and degranulated mast cells, and decreased the level of a variety of inflammatory cytokines . Furthermore, systemic infusion of GMSCs exhibited remarkable immune tolerance and promoted the survival of skin allografts with an increased infiltration of Tregs . Most recently, the promising therapeutic effect of GMSCs was demonstrated in an experimental collagen-induced arthritis model. Infusion of GMSCs significantly reduced the severity of arthritis and down-regulated the production of inflammatory cytokines (interferon-γ and interleukin-17A) . These findings support immunomodulatory effects of GMSCs and their interplay with innate and adaptive immune cells as well as their potential clinical applications in the treatment of several inflammation-related disease models [14••, 78, 83, 84, 87, 88]. Mesenchymal DSCs derived from oral and maxillofacial regions are easily accessible multipotent cells that can be non-invasively isolated and differentiated. Accumulating findings from various in vivo and in vitro studies provide hope for future applications of DSCs in regenerative dentistry and systemic degenerative diseases. In particular, as DSCs possess immunomodulatory capabilities to intervene both innate and adaptive immunity, their use for treating graft-vs.-host disease (GvHD), immune- and inflammation-related diseases holds great promise. However, several issues still need to be resolved, including the ex vivo expansion, differentiation efficiency, and safety in the use of DSCs. In addition, reliable ways to control previously inflammatory environments need to be established before the application of DSCs for the purpose of tissue regeneration. Further studies should be performed to clarify the underlying mechanisms of regeneration of the lost tissues and immunomodulatory properties of DSCs and then move the field forwards to human clinical trials. This work was supported by National Institute of Health Research Grant, R01DE 019932, Oral and Maxillofacial Surgery Foundation (OMSF) Research Grant. Dr. Su-Min Lee and Dr. Qunzhou Zhang declare this work was supported by National Institute of Health Research Grant, R01DE 019932, Oral and Maxillofacial Surgery Foundation (OMSF) Research Grant. Dr. Anh D. Le declares this work was supported by National Institute of Health Research Grant, R01DE 019932, Oral and Maxillofacial Surgery Foundation (OMSF) Research Grant.